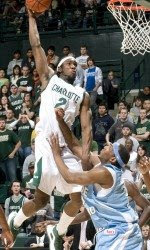 The acrobatic dunks by senior forward Charlie Coley that excited Charlotte 49ers basketball fans the past two seasons could soon be featured on an international stage. Coley, who finished second all-time in school history with 102 dunks, was among five players selected by the famous Harlem Globetrotters in the team’s third annual draft. Coley, a 6-foot-7 forward who averaged 8.9 points and a team-high 6.8 rebounds this past season, won back-to-back slam dunk contests during the 49ers’ annual Basketball Madness. He also finished as runner-up in the 2009 ESPN Slam Dunk Championship. Oddly enough, one of the other four players drafted by the Globetrotters, New Mexico’s Taylor Danridge, beat Coley in the finals of the ESPN dunk contest. Each of the drafted players have been extended an invitation to fall training camp during which they will compete for a spot on the Globetrotters, which will begin their 84th season. The Globetrotters, featuring their entertaining brand of basketball, have played in more than 120 countries in front of more than 130 million fans since their inception. Who knew the Globetrotters had a draft? And why do you draft someone and then put them thru tryouts in the fall? So that they can both keep their franchise in the news and make those kids more likely to give up a real basketball career with some early press.